An Old Fashioned should be a part of everyone's cocktail arsenal, along with Negronis, Manhattans, and your standard vodka sodas/tonics, gin & tonics, margaritas, mint juleps, etc. If you have a home bar, you must learn how to make this the right way. Plus, if the Lush Chef ever comes over to your place, she'll ask you to make her one, because it's her favorite cocktail. There are some differing opinions on what qualifies as an Old Fashioned. 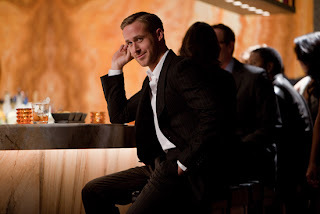 Some people put a crapload of muddled cherries and oranges in there, but I'm more of a purist, like Ryan Gosling here. I prefer the old, Old Fashioned—a true cocktail that contains just bourbon, some water, a sugar cube, bitters and maybe a citrus twist. The first Old Fashioned was supposedly served in the 1880's at a gentleman's only club (thank goodness I'm alive now) in Louisville, Kentucky called the Pendennis Club. It was then popularized by a club member who introduced it to the Waldorf Astoria in New York. Now I mentioned above that I'm a bit of a purist, but I make occasional exceptions. This Vanilla Bean Old Fashioned from Tasting Table doesn't throw in an abhorrence of fruit, and it substitutes a white sugar cube with vanilla sugar and Angostura bitters with orange bitters. If you're looking for a fun winter variation on the standard Old Fashioned, I highly recommend this. If you're lucky to be my friend, then you may get to experience this drink with my Bitter Revenge Buzzkill bitters—the coffee pecan flavor just warms up the vanilla even more. - In a glass, combine the sugar, bitters, orange peel and water. - Muddle until the sugar is dissolved. - Add the ice cube and pour the bourbon over top. - Stir for about 15 seconds, then garnish with the vanilla bean. *To make vanilla sugar, slice a vanilla bean in half lengthwise. Add to 1-2 cups white, granulated sugar and let it sit in a covered container for 2 weeks.